Tate Wood Craft Studio (楯木工) is one of the wood craft studios located in Nagiso, Nagano Prefecture. Tate Studio creates many original wood craft works and especially Kumikizaiku. Kumikizaiku is the traditional wood craft works developed by many traditional craftsmen. This studio offers a tour and has an experiencing making Kumikizaiku. Ask the stuff to do the studio tour. 1. use JR Chuo Line to Nagiso Station. Tatemoku is a wood craft studio located in Nagiso, Nagano Prefecture. 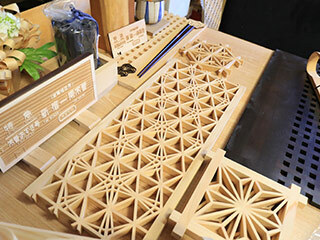 It produces wood crafts, furniture and Kumikozaiku Arts. Tatemoku was established in 1948. Tatemoku use Kiso Hinoki Tress that has a great texture of feeling. Tatemoku also designs unique arts and furniture that use both Hinoki Trees and Kumikizaiku art. You can also order your design. Also, Tatemoku has their own shop at Tsumagojuku that is called "Sashimonoya."